Battle reports were always one of my favorite parts of the old White Dwarfs and I definitely feel their absence in the current issues. Luckily there are a multitude of Youtube channels out there now that do video battle reports, so you can watch the games unfold instead of just reading about it. My favorite channel, and in my opinion, one of the best out there, is Guerrilla Miniature Games. Recently I was able to get Ash, the creator and host of the channel, to do a small interview for the site and talk about the behind the scenes aspects of running a daily tabletop gaming channel. Tyler: How did you first enter into the hobby? Ash: I discovered Citadel Miniatures in the back of the old Choose-Your-Own-Adventure Fighting Fantasy books in 1988. There were a few of the old hard-plastic clamshells of Reiksgard at a local book shop and the rest is history. Tyler: What drew you to wanting to become an active member of the hobby online? Ash: It kind of just happened. I had moved back to Canada to the Niagara region in 2014 (I was born in Toronto, but my wife was born and raised here) and typed ‘Infinity Players Niagara’ into a search bar on Facebook. It had a post by MiniWargaming inviting people to come play Infinity so I played a game with Mat. A few weeks later I was working there and that was my first introduction really to the online media portion of wargaming. Tyler: You started Guerrilla Miniature Games on your own after leaving Mini Wargaming. Can you talk a bit about that and what it was like raising the funds to be able to start your own YouTube channel that’s updated daily? Ash: Well, GMG was something I started to make content in my spare time. I had a blog with the same name that I updated infrequently starting back in about 2009. I hadn’t edited a video and didn’t really know about YouTube until I worked at MWG (all my wargaming was real-life for the 22 years before that). The whole thing came about after I ran a crowd-fund to get camera equipment that went way beyond what I expected. People really wanted me to do more and the Studio, CoOp and the rest came out of that. 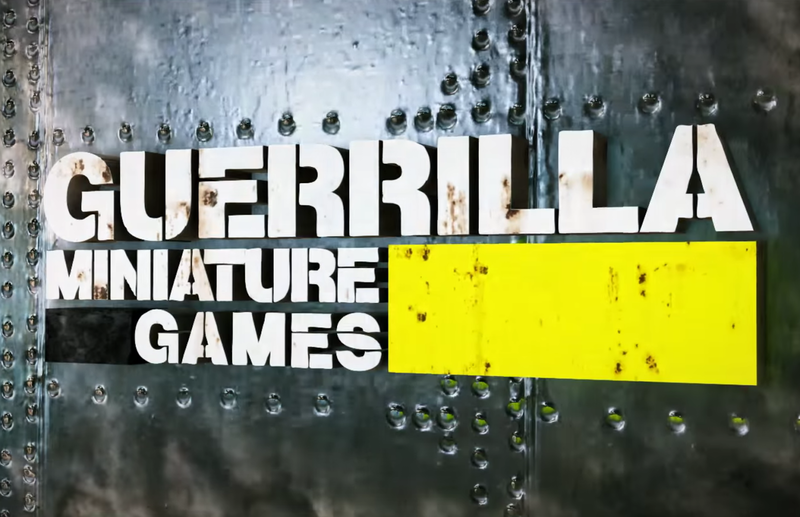 Tyler: Guerrilla Miniature Games has a multitude of games that you play and showcase. Which one or ones do you enjoy playing the most? Ash: I think what I actually enjoy is not HAVING to play the same game over and over again. I couldn’t just play 40k every week for years and year. I love learning new games and painting and creating the media that go into playing them… so being able to cover everything and anything I think really suits me and keeps me motivated. Tyler: Can you talk a bit about the Table Top Media CoOp and what it is? Ash: When I had the idea to build a studio I knew I wouldn’t be in it full time. There were several other artists in the area that made media to do with wargaming and I’d had experience with artists co-operatives when I was in school in Toronto. Pooling resources just makes everyones content better and it seemed like a great way to support and challenge each other in a really positive way! That’s the CoOp in a nutshell, a place where we can all create stuff and share resources. We all do our own thing, but everyone has lots of tools and workspace and other talents they wouldn’t necessarily have on their own. Tyler: Your opponents are sometimes people you know, but other times are people who have travelled to play against you. How does that work out? Ash: I’m a pretty easygoing guy, so I’ve no problem meeting and playing games with people from anywhere. I spent a lot of years traveling around meeting wargamers so the only real change is that now they travel to see me! As for my friends I’d say one of the biggest resources I’m lucky to have is an incredible and talented group of peers I’ve collected in the last few decades that are just as crazy for toy soldiers as I am (and just happen to also be really good people). The definitely add a ton to the quality and diversity of what I do. Tyler: Guerrilla Miniature Games was praised by the Age of Sigmar community for being one of the first battle report channels to really embrace the game and not play it begrudgingly. Was this due to a real enthusiasm for the game or more just wanting to present it in a positive light despite any personal feelings? Ash: I don’t think I was unique in enjoying Age of Sigmar from the beginning, I think I might just have a different perspective on change than most. I also really enjoy when I get to try new games and because I’m a guy that will happily play old and dead miniature games all the time I don’t have nearly the same emotional challenge when things move on. I tend to not look at it as my cart being turned over and more that I’ve found a bunch of new bits to figure out. That, coupled with the fact that I personally don’t see any point in wasting time talking about the things I don’t like (which are pretty few and far between when I’m enjoying a hobby, otherwise it wouldn’t be a hobby) and have a camera, is likely why I ended up the unlikely advocate that I did. Tyler: In your games of AoS you have used several different comp systems, including using nothing at all and playing right out of the box. Which of these has been your favorite to use? Ash: Although everyone tries to tell me that I should use a points based system, I’m inherently attracted to Wound based comp. Most Battleplans and the core rules themselves are usually destruction based for victory. Inherently, battlefield presence, not damage output (as damage output requires outside factors like being in range, movement speed, etc to measure value) becomes the most valuable factor in the game to my mind. The main argument against Wounds is that they aren’t all created equal, but I see this as a holdover from the previous edition where there had to be a ‘reason’ to take every model (in a points based system, less powerful models were ‘cheaper’ so you could get more of them… the value again was it was more wounds for your budget!) as well as people wanting to justify previous purchases. The biggest ‘reason’ for people wanting to create a point system is it allows them to continue to use past purchases and have them retain value. My argument against that is that over time, I doubt you’ll see GW release any weak units. The Bloodborn and Stormcast certainly don’t have a goblin or Clan Rat equivalent in them. I see these units as anachronistic. Keep using them if you want, but you’re doing so because you like them, not because they’re necessarily going to be in the game in the future. Now that being said; I don’t see points as being BAD. Certainly, some kind of social contract is healthy for a community to be able to feel like everyone had a fair shot when they play. The bits that push me away from any of the community point systems are a) Some I’ve seen are very inflexible. They require you to take X or Y numbers of models (10’s, adding by 5’s for instance). I’m not a fan of ‘blocky’ army building like that. Age of Sigmar is very freeform and I gravitate towards formats that do their best to preserve that. b) The matrixes they’re based are always going to be subjective to the author. They’re a ‘made up’ value based on what the creator believes is the proper weighting and are (in every game, not just this one!) best guesses. c) I need to incorporate a whole additional set of printed rules in order to play a game, and also wait for them to update to include new units in order to play ‘properly’. But to each their own! I’m a guy that will always prefer simple over complex. I’ve yet to have a game of Age of Sigmar that felt lopsided by balancing with Wounds and playing to the Battleplan, so I don’t think I’ll be changing any time soon. Tyler: Like I said before, you play many different games on you channel, including AoS, 8th edition, and 9th Age. As someone who has difficulty remembering all of the rules to just one game system half the time, how do you keep all of the different rule systems straight? Ash: Because I can futz around all I want when the camera isn’t running. But honestly, I guess I’m just wired that way. Most mistakes I make do come from edition lag, or carrying things from one game to the other, but I’ve wired myself to try to check things that don’t quite seem right before I shoot, so we try to keep it to a minimum. That said, I doubt I’ve ever seen a game that didn’t have mistakes in it when it was recorded and put online. The important thing is to try not to make that mistake again! Tyler: How often do you game? Ash: I record at least five games a week to keep up with my program schedule, during the two and a half days when I’m not home with my kids. I’ve played about 300 games of various systems since I started recording my own content for GMG. Tyler: Now that this is pretty much a full time job for you, do you still find time to play a game just for fun, or does everything get recorded? Ash: Owen and I actually went to a great charity event in Buffalo called AD: Food Drop for Infinity last fall. It was important for us to get out and game a bit just for ourselves. We had a blast and they did a great job raising food for charity! Tyler: Can you walk us through the process of producing one of your battle reports? Ash: It’s pretty simple. Shoot an intro, set up the game and film the IMPORTANT action, not the dithering. Shoot an outro. That’s about it! The biggest thing is to edit while you shoot as it makes editing FAR easier later. Tyler: Can you talk a bit about all of the great scenery and models you have on your channel? Is this a collection you have had over time, or something you procured for the show? Ash: Miniature-wise, everything is mine. After 24 years I’ve amassed a lot of models for tons of games (lots of which you guys still haven’t seen). I’d say about 75% of the Terrain was made by myself, with the other 25% having been made by my buddy Adam at Greenleaf terrain. My Terrain collection was VERY sparse on natural and medieval terrain when we started the studio so a really kind IndieGoGo backer commissioned Adam to make hills, trees and whatnot for us to shoot on. He also shows up with random bits and bobs all the time, because he’s just an awesome guy. I recently commissioned him myself to make the desert terrain for our studio mostly to save time, and also because he’s a good buddy and I’ll send him work whenever I can. I’ve got some great pieces from Ben at Homebrewed Worlds as well. He’s another great talent I collaborate with a lot. Tyler: What games would you like to add to your show’s roster in the future? Tyler: What else can we expect from Guerrilla Miniature Games going forward? Ash: Hopefully I keep surprising people. The great thing about my love of indie games is I’ve got this amazing platform to help designers that are doing the most courageous thing there is; Making something and putting it out into the world. The amazing thing about that for my audience and the astonishingly cool Patrons that I have is that there’s never a dull moment for any of us; we’re always getting to check out new stuff. It’s a bit like the gaming equivalent of an Indie radio station. You get to hear the bands before they become famous and won’t go to the bar with you afterwards. 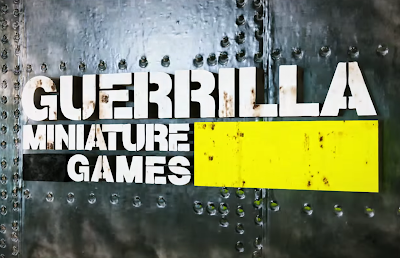 Be sure to subscribe to Guerrilla Miniature Games on Youtube to stay up to date on his daily video releases. You will also notice that I have them listed over on the side under My Blog list, which is updated every time a new video is posted. I would like to thank Ash for taking the time to do this interview for me and I look forward to watching even more table top carnage unfold in his battle report videos in the future.